In 2005, the French made the news all over the world when they installed book-vending machines in the streets of Paris. A few years later, they are literally throwing books at each other’s heads. 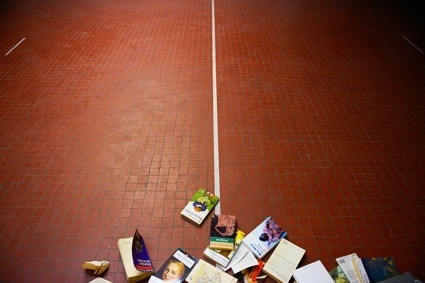 One of the performances i was really annoyed to miss was Yves Durathon‘sbookfighting. The concept, rules and spirit are embedded into the title. Wearing protective gear and following strict rules, the fighters pick up pocket books from a heap and use them as projectiles for combats. 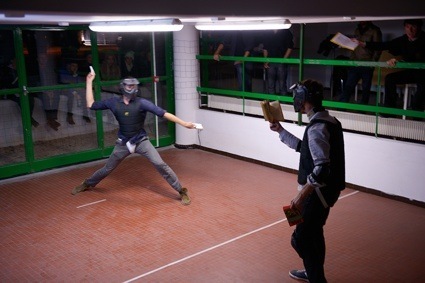 Bookfighting started as a performance and has grown into a practice mixing combat sports and culture. 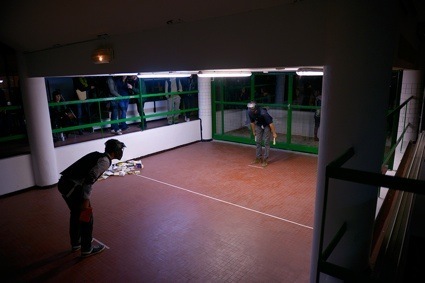 With this sport, Durathon wanted to celebrate the passage from paper culture to digital culture. Books, as we know them, are already objects from the past and the new combat sport is probably the only remaining mode to enjoy them in a lively, joyful way.